Farming equipment has come a long way over the last decades and centuries. But the fact is that even with the research and development we’re now capable of, engineering still occasionally falls short in designing reliable machinery. And it seems to be that the more that advances in technology push farming equipment into new levels of high-tech complexity, the worse the problems are when they do happen. For the average farmer, the expense of replacing a vital piece of machinery before the end of its expected lifespan is often beyond their financial capacity. And even when it’s just replacing individual parts, waiting for suppliers to get a hold of the stock, and then wasting valuable time fixing the machinery can have a terrible impact on productivity. It can even cause large-scale financial disasters, if it ends up being too late to sow or harvest a crop. Sometimes a fault in farming machinery isn’t urgent. But even if the situation isn’t dire, it’s still causing aggravation, and the daily grind to be harder than it should be. And sometimes, it’s simply a case of the only equipment available on the market—across all the industry’s suppliers—just not delivering the results you need. So what are the farmers to do? Continue an unnecessarily hard slog while they’re waiting for the companies who engineered and manufactured the equipment to develop a new solution to a problem they overlooked, or release an improved model? Continue to fight with faulty equipment, and waste valuable working hours and money? Sometimes, it just takes the right kind of thinking to come up with a solution. It could be a simple alteration, just one small addition that can make a world of difference to the way a piece of equipment works—and what you can achieve with it. Many of the problems now are that technology is changing the world. And while that’s a good thing the majority of the time, it’s caused a lot of problems in the agricultural industry. Farming machinery has developed to such a level of sophistication that when something does go wrong, farmers aren’t just dealing with simple mechanical issues—they’re dealing with elaborate electronic motherboards and complex computerised systems that cost a fortune (and the skills of tech-heads) to fix. Farming equipment isn’t just getting more complex to operate. It’s also getting more expensive, with some pieces of essential machinery costing upwards of six figures. Most farming jobs that were traditionally done by hand are now being done by monstrous machines, that offer both unprecedented precision—and huge financial liability. The days of solving a machinery problem with a toolbox full of spanners and screwdrivers seem to be over, and farmers need to be looking to a new kind of innovation to solve their problems and maintain their productivity. Australian farmers are an innovative lot, always coming up with their own solutions when problems pop up in their equipment. They have to be, because they’re working in an industry—and a country—that’s characterised by unpredictability and instability. Most farmers have been repairing their own equipment for their entire lives, since their fathers and grandfathers first showed them how. Building and rebuilding, altering and adding, and innovating traditional equipment has always been a huge part of Australia’s primary industries. If there was a record of all the inventions Australian farmers had made, we’d probably be recognised as the world leader in engineering. But the same Australian farmers that have been taking care of their own business for generations now find themselves dependent on third party manufacturers. When something blows up in their equipment, they’re reliant on the manufacturer for the technical maintenance and repairs that such complex pieces of machinery demand. Not only are they then stuck waiting for technicians to come and fix it, they’re also up for the fat fees that come with the privilege—and that’s obviously hard to deal with. It’s no wonder then that so many farmers have chosen to completely give up on computerised systems, opting to forgo the technological benefits of modern equipment for the familiarity of traditional machinery. Better the devil you know, it seems. While Australian farmers’ demand for newer machinery is falling—at the same time as the demand for older, non-digital equipment is rising—there’s still a time and a place for making modifications to older equipment to give the farmer extended life and reduce the maintenance cost by modifying any areas or parts that are not available due to parts no longer being manufactured because of the age of the machine. Farmers simply can’t afford to wait for manufacturers to make improvements on their equipment—or afford to upgrade their existing equipment. This is where engineering comes in. 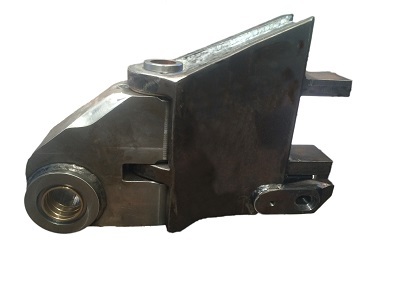 In conjunction with local farmers, Werner Engineering have designed and manufactured a prototype track adjuster. We undertook the task to save our farmers money and improve the performance of the machinery, by eliminating premature track wear that occurs due to misalignment of the tracks. The track wear was resulting in friction and damage, and causing early replacement of drive tracks that are a major expense for operators. The prototype uses several existing machinery parts, and has proven to be successful in testing phases. The modification now has the potential to be distributed worldwide in kit form, allowing the farmer or local boilermaker to attach it to the tractor on site. It’s a brave new world for Australian farmers. That’s why Werner Engineering are always waiting to hear from our primary industry professionals, and to see what solutions we can work together to achieve. Contact us anytime for advice, and we’ll be happy to help you solve your problems and improve your productivity for a sustainable future..
Our machine shop houses some of the latest CNC Lathes, Milling machines and borers available as well as a range or manual machines operated by our first class machinists.